1. Heat ½ tbsp oil in a large frying pan and cook the meatballs over a medium-high heat for 10-12 minutes, turning regularly, until golden. Remove and set aside. 2. Discard the excess oil and wipe out the pan. Return to a medium heat with 1 tbsp oil and the garlic. Cook for 1-2 minutes until the garlic is just turning golden. Add the tomatoes; cook for 5 minutes until just soft, then stir in 3 tbsp water. Return the meatballs to the pan and simmer for 6-7 minutes, stirring occasionally, until completely cooked through with no pink meat; season. 3. Meanwhile, cook the spaghetti in a pan of boiling salted water according to pack instructions, then drain. Microwave the courgette spaghetti according to pack instructions. Toss both together with the remaining ½ tbsp oil and pile into shallow bowls. Stir the basil through the meatball mixture, then spoon over the spaghetti and scatter the parmesan shavings on top. 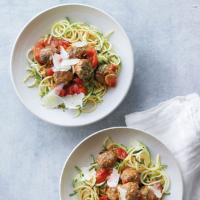 Including courgette spaghetti in this recipe is a simple way to get an extra portion of vegetables in your diet. This recipe appeared within the September 2018 recipe card collection. This recipe was first published in Thu Aug 30 13:34:20 BST 2018.